Almost exactly 30 years ago, guitarist John Scofield recorded an album he evocatively titled Loud Jazz. Not quite a decade later, he made one called Quiet. Both albums were statements of intent, widely embraced and justly acclaimed. And despite the obvious differences between the two, both were genuine expressions of Scofield's musical personality, which has always been more flexible than those extreme dynamic markings would seem to suggest. 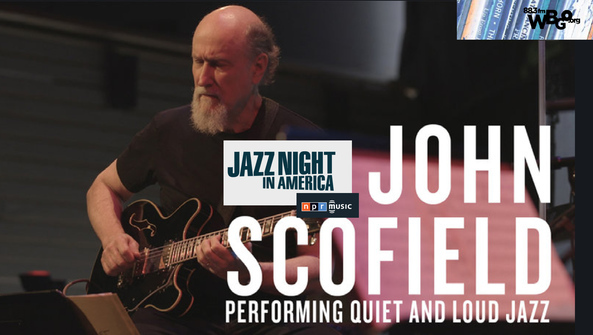 Scofield, of course, is one of the most prolific and admired jazz musicians of his generation, an ace with boppish phraseology as well as bluesy inflection. He's 65 now, and by some measures you could even say he's at the height of his career. Jazz Night In America caught up with Scofield this past spring, just before he played a concert called "Quiet And Loud Jazz" in Jazz at Lincoln Center's Appel Room. One portion of the night featured a reunion of the Loud Jazz crew, with partners like bassist Gary Grainger and drummer Dennis Chambers. Another portion recreated the chamber arrangements from Quiet, with Scofield's longtime foil Joe Lovano standing in for Wayne Shorter on saxophones. The idea was to both acknowledge and bridge the distance between the two disparate albums, which might have been more difficult were it not for Scofield's sly consistency. "It's not like other famous jazz musicians, where their style changes, you know, decade to decade," says Jim Beard, the veteran keyboardist on hand for the Loud Jazz half of the concert. "He sounds very similar to what he sounded like, you know, 30 years ago. I don't think he sounds that different. And it's just such a strong personal style that that's amazing."